Employment Forms are forms needed and used for employment. This includes job applications, W-2s, I-9, and other forms when you are hired. 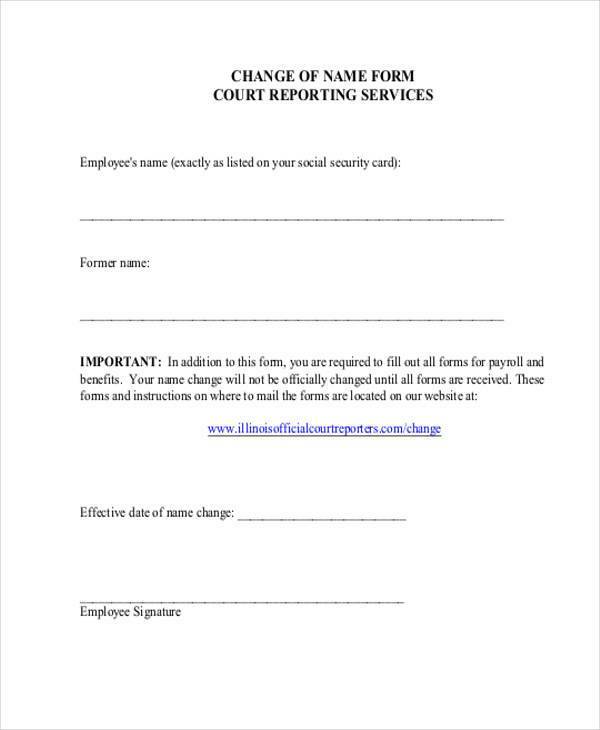 An example of an Employee Form is the Employee Name Change Form. A common instance of name change in the office is when an employee wishes to change her surname to that of her husband’s right after marriage. 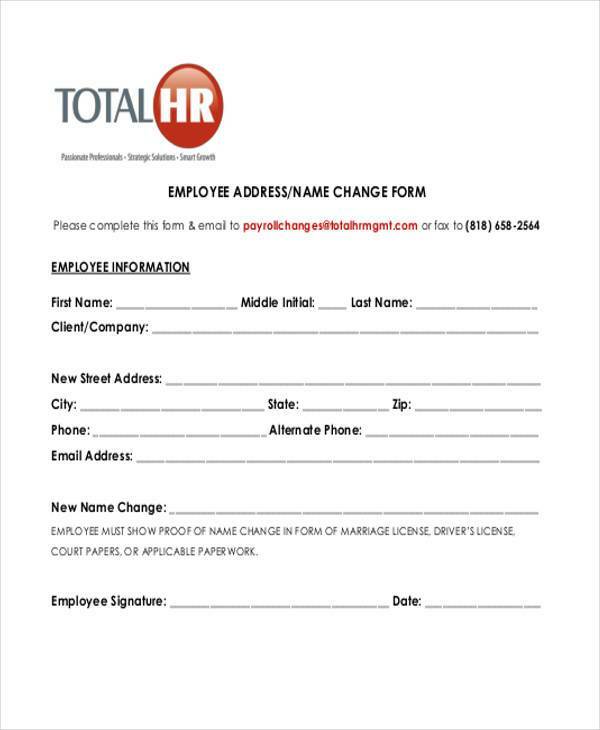 An Employee Name Change Form is a form that you submit when you request for a change of name, especially for a newly married employee. 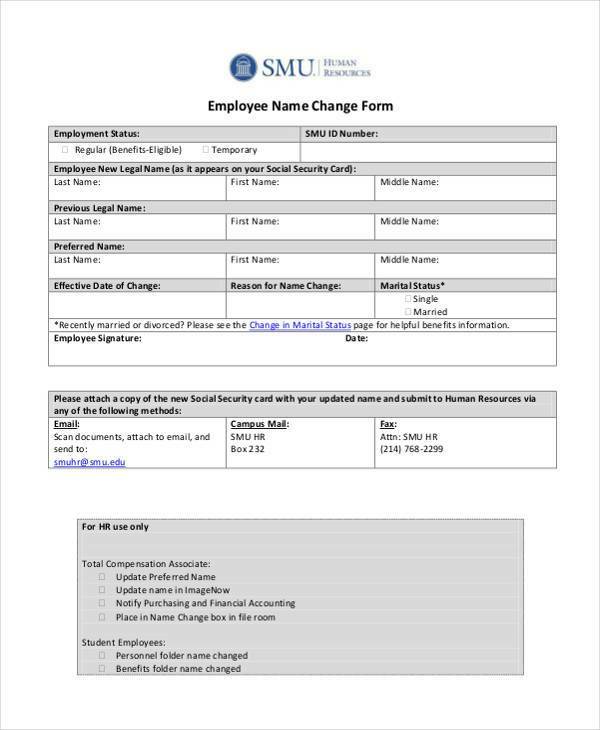 Shown below are some examples of Employee Name Change Forms that you can download and use for future purposes. Take the necessary steps to change the name on their Social Security Card. Have the name changed in the payroll personnel system. Update their name on the benefits record. Obtain a new identification card. 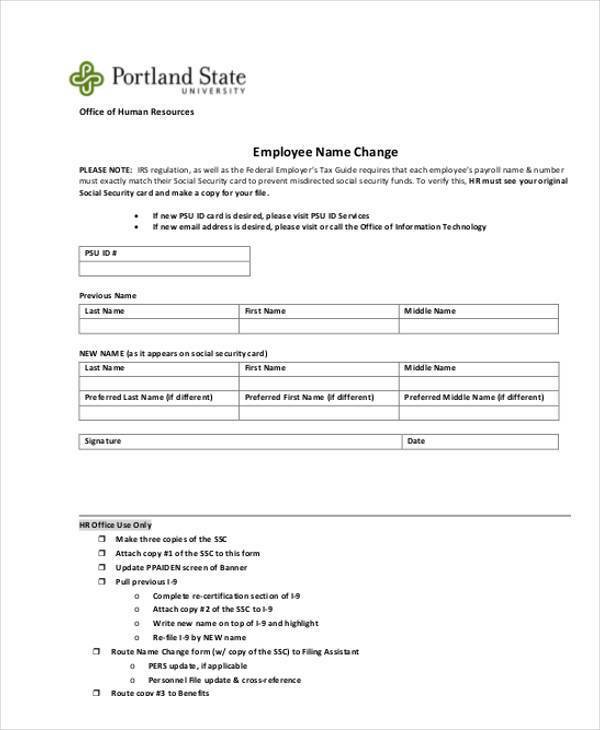 Why Is Employee Name Change Important? 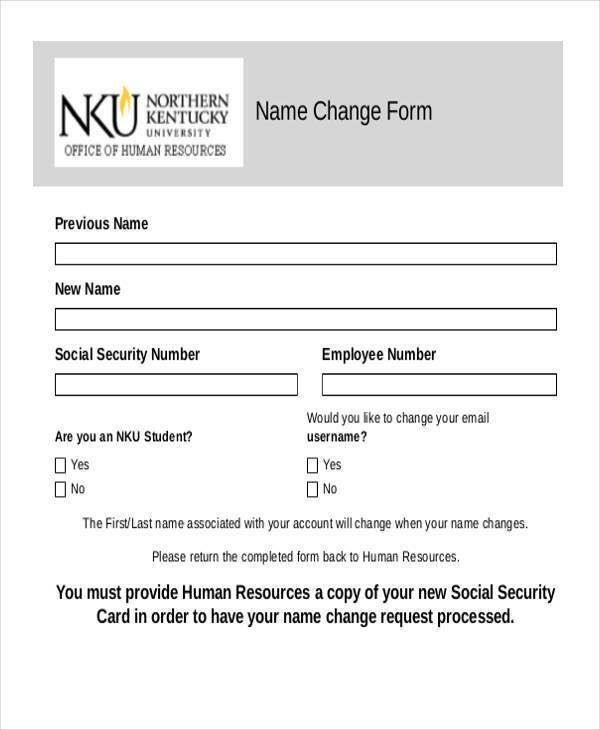 Although a person may change or use a name without any formal and legal steps, he or she will not be recognized as having changed their name until they go through the formal steps to go by their new name. If a person alters their name with the intent to act as a fraud, or with an intention to deceive or contradict the law, they may be subject to legal punishment and criminal proceedings. 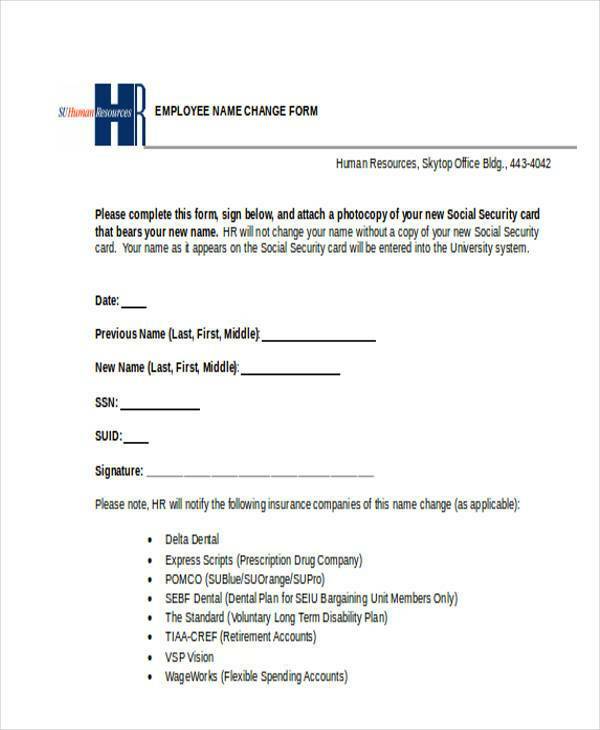 While going about the name change process, you can also check out our Employee Status Change Forms, which are used to keep track of an employee’s benefits. 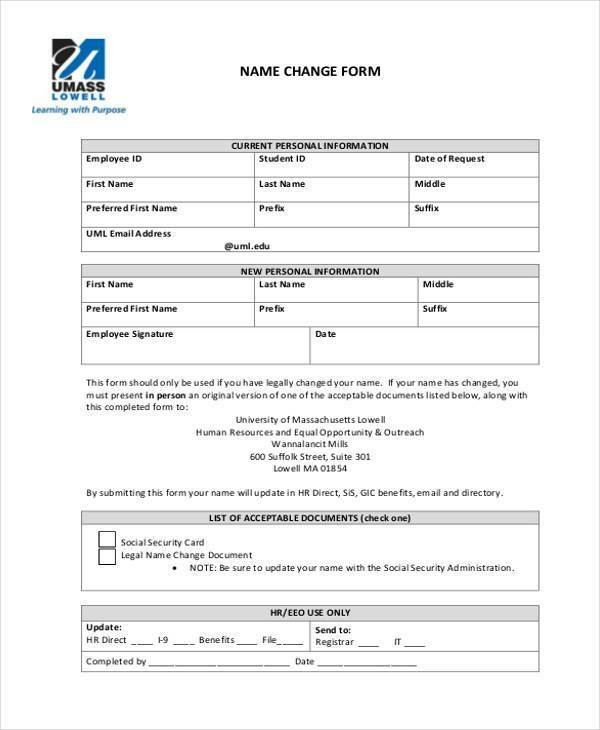 Name and Address Changes – Newly married employees must apply to the SS Administration when changing their names and addresses. The organization’s HR will adjust the employee’s information accordingly. Update Benefit Information – Benefits that affect a newly married employee and should be updated include the health and dental insurance, long-term disability plans, life insurance plans, etc. Adjust Filing Status and Withholding Information – In the event a newly married employee plans to file a joint tax return, they may want to consider adjusting their withholding allowances based on the new combined income. Emergency Contact Information – For beneficial purposes, contact lists, email systems, and emergency contacts should be updated. Adjust Bank Accounts and Direct Deposit Information – Couples after marriage usually decide to set up a joint bank account. The HR Department will make the necessary adjustments for the newly married employee for allocating wages into a new bank account. 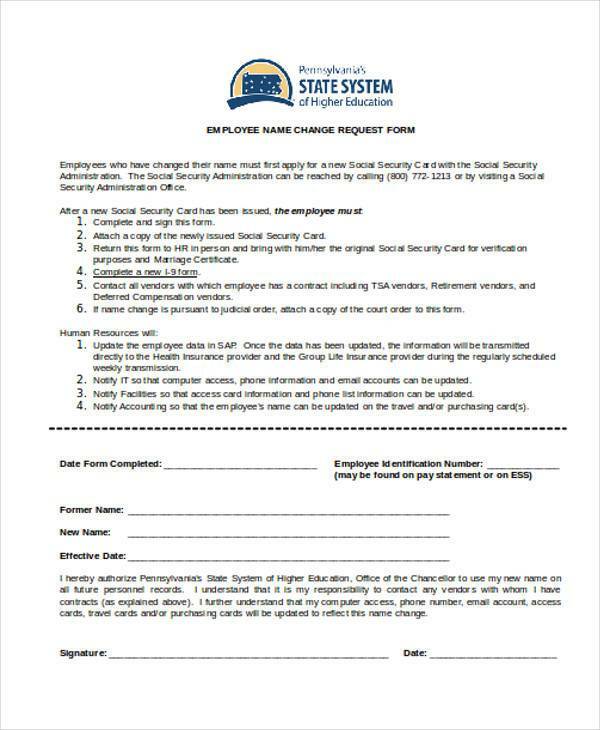 Employee Information Forms are the forms used to enable the Human Resource department to record employee information and help obtain a variety of information from the employee.